Welcome back to another issue of Milk Bar Mornings, the show where we analyze various songs from the series through story and technicalities. This week we will be looking at the various dungeon themes present in Lorule, an alternate world ventured through in A Link Between Worlds. Lorule’s dungeons are highly similar to those in the Dark World in the games predecessor, A Link to the Past, some dungeons serving as remakes of A Link to the Past, and others serving as extensions to dungeons in the Dark World. With this in place, the composers for A Link Between Worlds have done the great deed of creating all new original tracks for every Lorule Dungeon, setting them apart from the Dark World counterpart. So hit the jump to see what we have in-store for this week! 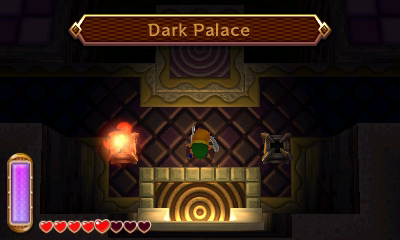 The Dark Palace is the Lorule version of the Dark Palace featured in A Link to the Past. Though technically the same temple, the temple features a completely different tone and overall existence in A Link Between Worlds, holding a similar layout to the Eastern Palace, rather than a completely original layout. As the name states, the Dark Palace’s main theme is darkness, and the player must heavily rely on solving puzzles in the dark. The theme features many eerie synths, a horn, and trills on the piano, together creating a theme similar to the background music in a horror movie. The story in the theme is a story of, well, darkness. Outside the temple is a large maze which the player must navigate through, guarded by the many fallen soldiers of Lorule, who have been turned into soulless zombies due to the darkness present in the land. In the dungeon itself, very little light is present. The eerie synths in the theme creates a feeling as if the player is not just being watched, but as if any creature could step out of the darkness at any time, leading to a terrible fate. The somber horn playing the melody reminds the player of the evil that is in the temple, and that there is a goal to be achieved. The piano serves as the creatures in the dark, quickly moving, making sure they aren’t seen. Together, the theme creates a creepy song that will keep the player scared of the dark. The Thieves’ Hideout is a dungeon located in Thieves’ Town, the Lorule counter-part of Kakariko Village. As the name suggests, the town is populated by singing thieves, each one with their own secret. Thieves’ Town served as a dungeon in A Link to the Past, but this parallel area is expanded when with the addition of Thieves’ Hideout. Here Link is accompanied by a partner through most of the dungeon, the girl known only as “Thief Girl”. The theme for the dungeon features strings through out the entire piece along with occasional woodwinds. The story in the theme for the dungeon is a story of stealth. 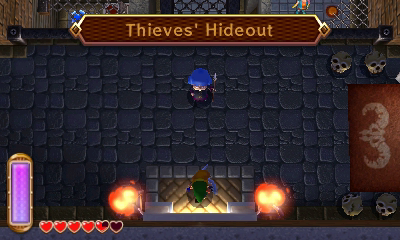 Through out the portions of the dungeon featuring the Thief Girl, Link must protect her from Zazaks, a species of monster present only in this dungeon (excluding the Treacherous Tower). To protect her, Link must either be stealthy, making sure he is not caught in the site of any Zazaks, or undergo a vicious battle. The theme of the dungeon perfectly reflects the stealth that is needed to avoid being caught, featuring quick notes being played by the strings. The melody of the theme reminds the player of the creatures in the dungeon, reminding that the player is in enemy territory and that it would be best to hurry out of the hideout, and out of town. Skull Woods is the Lorule counterpart of the Lost Woods. 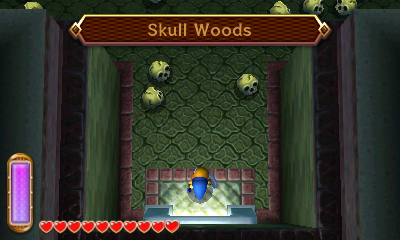 The Skull Woods is a creepy dungeon with, as the name suggests, skulls scattered through out the dungeon. The dungeon is infested Wallmasters, which will grab the player back to the dungeon entrance if the player is caught by one, yet the serve as a important element in solving puzzles in the dungeon. The theme features many atmospheric instruments, including strings, a piano, and a variety of creepy synths, all topped off with the occasional sound of wind blowing. The story in the theme for the dungeon is a story of being watched. A primary theme in the dungeon is eyes, with many puzzles involving eyes, and the boss sporting a large eye as its weak spot. With the dungeon crawling with Wallmasters it is important for the player to realize that they need to be quick with every puzzle, making sure that they fulfill what needs to be fulfilled, and hurry to the next room before they are grabbed by a Wallmaster. The various synths spotlights the creepy feel of the dungeon, and the strange creatures that live inside of it. The piano plays the melody, menacing yet sly. Finally strings occasionally play quietly in the background, creating the feeling as if anything could jump out at you at anytime. Overall the theme creates a lasting feeling of being watched, knowing that once the player gets out of the dungeon, a new level of security will enter the player. That is all for this weeks issue of Milk Bar Mornings. Let me know what you thought of this issue in the comments below! Also let me know what you would like next weeks theme to be! Thanks for reading.